As the url says, me wants to be a GEEK, duh! So I decided to help promote & support the OneWebDay cause :) As my office printers were all black and white I decided to have this poster. 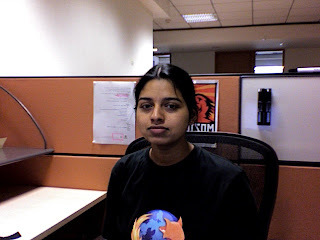 My cubicle was already adorned with a "Mozilla - 10 years" coloured poster (courstesy l0nwlf) and now I had this brand new OneWebDay poster beside it too. 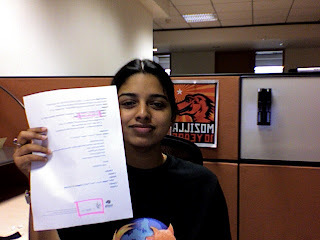 As the poster was pretty dull, I decided to show off a lil creativity and used some pink highlighter on it :P Here's a snap with /me in my fav Firefox T and the OneWebDay poster in my cubicle. As the Imac, from which I clicked the pic was pretty far, here's a close up of me with the poster in my hand. This is great. Love the backwards meme. Great post.Thanks a lot for your post. Well, I am not much of a geek but being an engineering student I have my share of tech exposure. So this blog is dedicated to all the big small things I work on, the problems I face and the things which catch my interest. P.S. : If you find this interesting and you want to make a contribution, you know whom to contact.